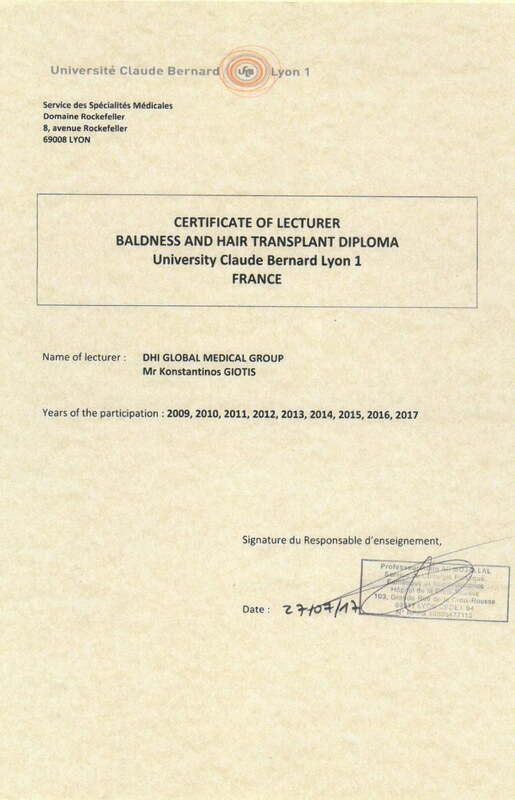 DHI Founder, Konstantinos P. Giotis, was awarded the certificate of “Baldness and Hair Transplant Diploma” by the University Claude Bernard of Lyon in France, after successfully teaching and contributing to the courses and annual lectures during the last nine years. The last lecture of Mr. Giotis was held on Thursday, April 20th 2017, and supervisor of the academic seminar was Professor of the University of Lyon, Dr. Yves Crassas. Meanwhile, during the lecture of Mr. Giotis, participants’ doctors at the seminar had the unique opportunity to watch a live hair transplant session with Direct Hair Implantation technique and learn every step of the DSA. Global leader in hair restoration since 1970, DHI Global Medical Group has established partnerships with public European Universities and actively contributes to courses and seminars.